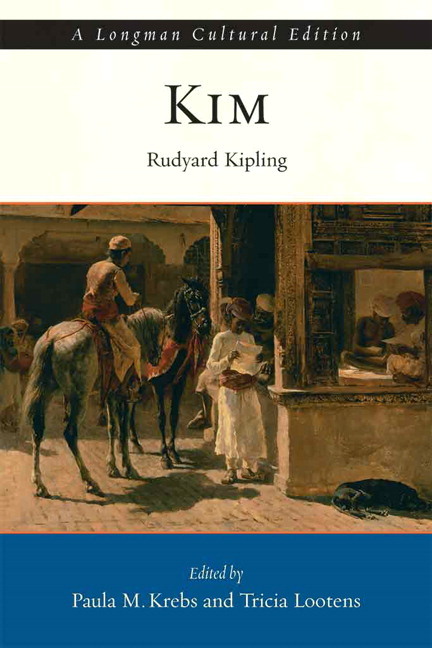 From Longman's Cultural Edition series, Rudyard Kipling's Kim, edited by Paula M. Krebs and Tricia Lootens, sets Kipling's most important novel in both its imperial and its literary contexts. Ever since its publication in 1900, Kipling's story of British India has catalyzed fantasies and debates over colonialism and imperialism. Through a series of selections from Kipling's poetry, travel writing, autobiography--and, crucially, his work as a young journalist--this edition offers students and teachers new ways of reading the tale of how the young streetwise Kim, "Little Friend of All the World," becomes both a Buddhist holy man's disciple and a British spy. A startling, hitherto unpublished excerpt from the manuscript of the novel offers new insight into Kipling’s composition process. A comprehensive glossary eliminates the need for intrusive footnoting. Wide-ranging Kipling short stories and poems open up new access points to the origins and afterlives of Kim and its characters. An introductory discussion of the novel's links to global as well as British colonial politics provides new insight into contemporary imperial issues. Carefully selected readings from British Indian Survey documents and Indian journalism on Russian-British tensions at the Afghan border join an intimate, radically ambivalent 1897 essay by a colonial administrator and excerpts from Kipling's early journalism and travel writing to create a richly suggestive context for the novel. Sample illustrations from the original U. S. serialized publication as well as J. L. Kipling’s bas reliefs, contemporary travel illustration and photography, and an MGM film advertisement encourage readers to attend to Kim as serial, novel, and film. Longman Cultural Editions include both primary texts of major writers and contemporaneous material that contextualizes those texts, including reviews, critical essays, responses, and newspaper and magazine articles. Longman Cultural Editions can be purchased individually, or a single volume can be packaged at no additional cost with The Longman Anthology of British Literature.